Want to lower the cost per conversion of your Facebook ads? Wondering how to serve the right ad to the right audience? In this article, you’ll discover a six-step plan to test, analyze, and optimize Facebook ads, as well as the audience segments you target. 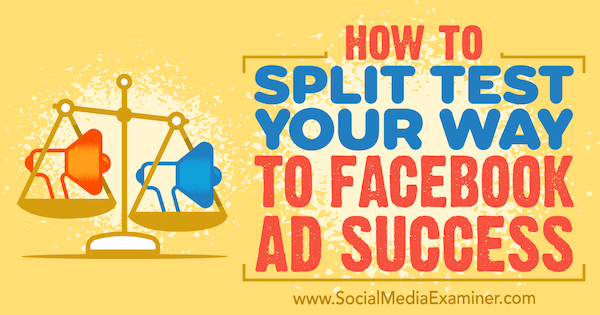 How to Split Test Your Way to Facebook Ads Success by Azriel Ratz on Social Media Examiner. 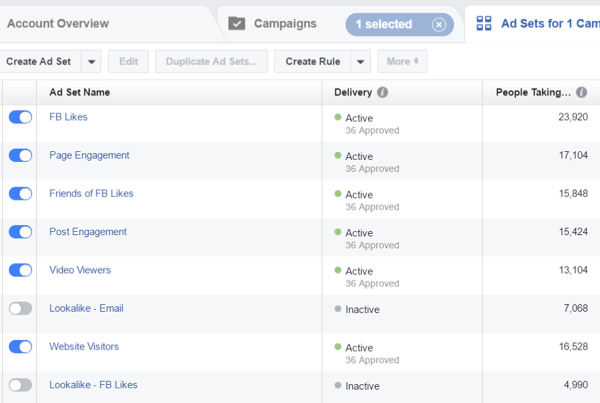 When you run Facebook ads, by default you’re charged based on the number of impressions your ad receives. So if you’re running ads and no one is clicking, liking, or sharing them, you’re paying Facebook. If the same people you reach share, like, and click your ads, you pay the same amount of money. So how does Facebook decide how much to charge you for those impressions? What you want to do is serve the best ad to your best potential audience so Facebook will give you the cheapest cost per 1,000 impressions (CPM). The best way to do this is to create multiple ads and let Facebook test them. Then make sure the ads are fulfilling your other target stats and hitting your key performance indicators (KPIs). Note: Many marketers are afraid that Facebook will choose a winning ad too soon. But in my experience, when you run a conversion campaign, even at a small budget of $5 to $10 per ad set, Facebook will test at least a handful of ads. About 10% of the time, Facebook will choose just one or two ads to run. If you aren’t happy with the results, you can easily turn those ads off and Facebook will begin testing the other ads. Turn off ads that aren’t performing well and Facebook will start testing other ads in the campaign. You know which version of the ad will perform best with your audience. You know which ad Facebook will like most. The ad you created will perform well. My strategy allows you to learn from your ads, even if you can spend only $100 to $200 for testing. Here’s how to adapt this strategy for your business. 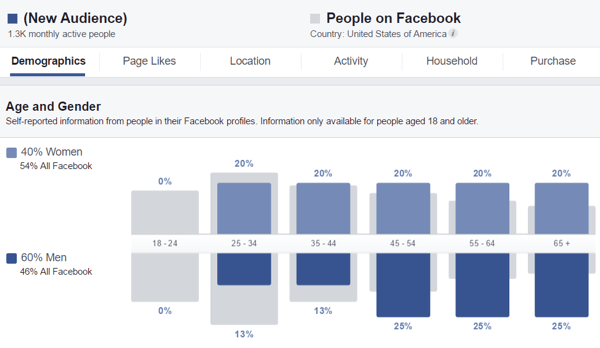 How old do you think your ideal audience is? Where do you think they live? After you answer those questions, you should have a more detailed picture of your customer. Now it’s time to find out if you’re right. Instead of grouping large audience segments into a single custom audience, create multiple custom audiences. 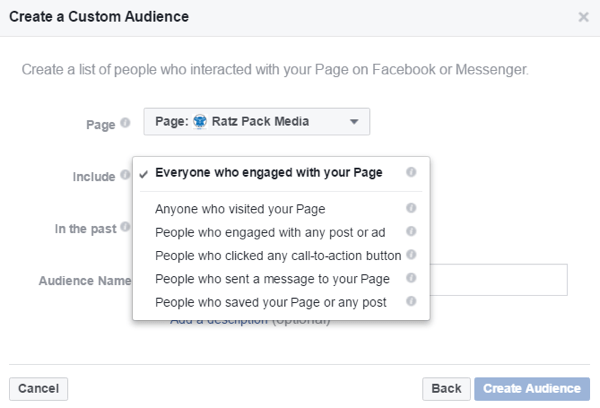 Create custom audiences based on people who interacted with your Facebook page. Set up multiple narrowly segmented custom audiences to target. Now use Facebook Audience Insights to compare your custom audiences to see if your picture of your customers aligns with who they really are. Go to your Audience Insights and select your purchasers audience in the Custom Audience section. If the audience is large enough (around 1,000 people), Facebook will give you a ton of data about these people. In Audience Insights, select the custom audience you want to analyze. Note: If you don’t have enough purchasers in this audience, choose another audience that’s larger and deep enough in your funnel, like email subscribers or website visitors. You won’t get insights as powerful as you would using actual buyers, but you should still be able to gain some useful information. First look at the Demographics tab. How large is this audience? Are these people mostly men or women? What are their ages? Are they single or in a relationship? Review demographic data about your audience in Audience Insights. Scan through the demographic data and evaluate how closely these data points match the information you wrote. Do you really understand your audience? Do you know who’s buying? Hopefully, your guesses were spot-on, but identifying any differences can help you better target your true audience. Now jump to the Activity tab. Do your buyers spend a lot of time on Facebook? Do they engage with ads more than regular users? Are they desktop or mobile users? If your past buyers rarely click on ads, it’s reasonable to suspect that your cost per click (CPC) will be high trying to get new potential buyers to your site. If your past buyers are mobile users, you’d better have a great mobile experience for future buyers. Review user activity data for your custom audience. Now look at the Location tab to find out where these purchasers live. Are you targeting these areas? It might be worth starting with the countries you’re already selling successfully to before targeting new countries. Find out where users in your custom audience live. Next, head over to the Page Likes section. Do these pages fit with the types of people you think are in your niche? Does anything stand out as surprising? Also, this is a great time to look at other pages in your niche and see how often they post, what types of media they post, and what their audience engages with. This can help you improve your organic reach. 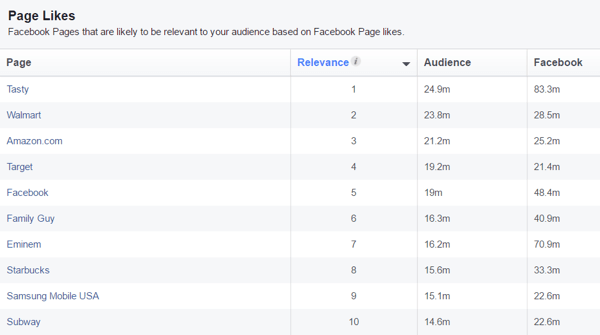 View a list of Facebook pages likely to be relevant to your custom audience. After you spend some time digging into your purchasers, analyze the rest of your custom audiences, answering the same questions above. View Audience Insights for all of your custom audience segments. Now compare what you’ve learned about all of these different audience segments. How similar are your other audience segments to your actual customers? Is there a disconnect between the types of people you’re attracting on Facebook or your email newsletter, and those who choose to buy? 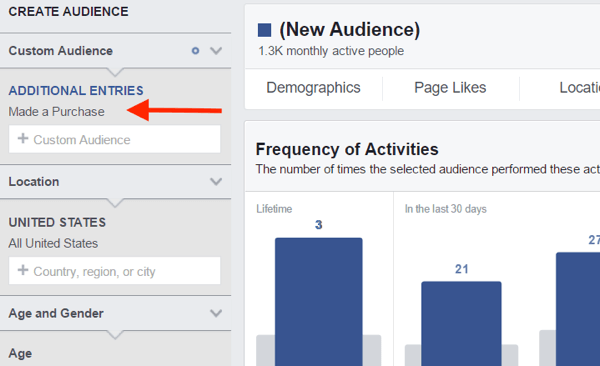 Compare the data you’ve gathered to see which audiences are worth targeting with Facebook ads and which aren’t. If your Facebook likes look nothing like your email subscribers, who look nothing like your actual buyers, it may be time for a new strategy. But what you have learned is that these audiences aren’t the same, and now you can do something about it! At this point, you’ve hopefully found the audiences most like your buying customers. You’ve also identified several large Facebook pages in your niche. Now you’re ready to create ad sets with properly targeted audiences and create lookalike audiences from the audiences most like your buyers. Start by running ads separately to each of these audiences so you can see which are the best-performing groups. The size of these ad sets depends on how large your daily budget is. I like to start an ad set with around $1 a day per 10,000 people in the audience. 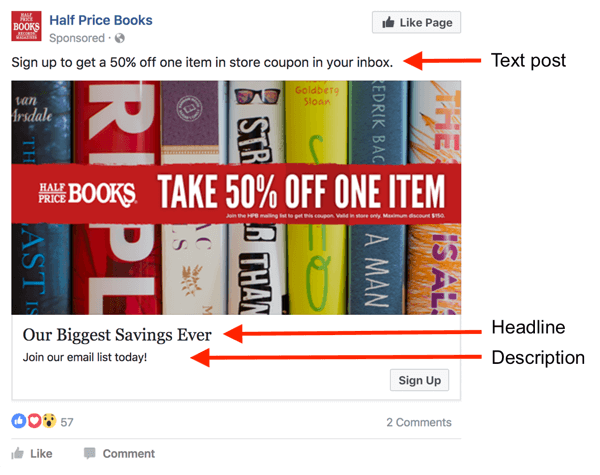 There are three areas for text in a Facebook ad. When Facebook looks at the text of your ad, they’ll note certain keywords that your audience may be interested in. Facebook will charge you based on the relevance and placement of the keywords. For example, if your audience engages with posts about “camping,” Facebook knows that one person engages with posts where “camping” shows up in the text post, but another clicks on posts that have “camping” in the description. Based on this information, Facebook will run the ad that best fits that user and will charge you the lowest possible price because they consider the ad relevant content. After you choose the image/video, duplicate the ad and switch the placement of two sentences. Then repeat the process until you’ve created every possible combination of text placement. You’ll end up with six versions of the ad. Change the placement of text in your ad to create multiple ad variations. Now select those six ads, duplicate them, and just change the image. Repeat this process for a total of four images/videos (or the same video with four different thumbnails). If you repeat this process with three new sentences (D, E, F), you’ll create a total of 48 ads (two versions of text give you 12 unique text placements, testing four images). Note: Facebook allows a maximum of 50 ads per ad set so don’t create more than that. Now you’ve created all of your ads. Simply duplicate the ad set and change the targeting. Repeat this process until you have 5 to 10 ad sets, each with 48 ads. Tip: Use a different UTM parameter for each ad set so you’ll be able to analyze the traffic you’re getting from your ads in Google Analytics. When creating the first ad, add “?utm_sub_campaign=[NAMEOFADSET]” to the end of the URL. This will allow you to analyze which ad sets are bringing in the highest-quality traffic and how long each audience is spending on the landing page. Create many variations of your Facebook ads to test text placements and images. You need to give Facebook time to optimize your ad sets. Turning off the ads in the first 36-48 hours doesn’t give Facebook enough time to optimize them appropriately. So wait for a full 48 hours before you compare the performance of your ads. The content is good, but it doesn’t appeal to the audience. This means you need to test new audiences. You’re reaching the right audience, but the content is bad. This means you need to create different content. If CPC is higher than normal, assuming you did the above step, you need to create more compelling ads. The targeting and message are correct, but you need to get the audience to act. To get the clicks, you may need to change the call to action, simply write “Click here to learn more,” or be more assertive. You’re spending way too much money on Audience Network. You’re reaching the wrong audience. The ad and the landing page don’t have a clear connection. 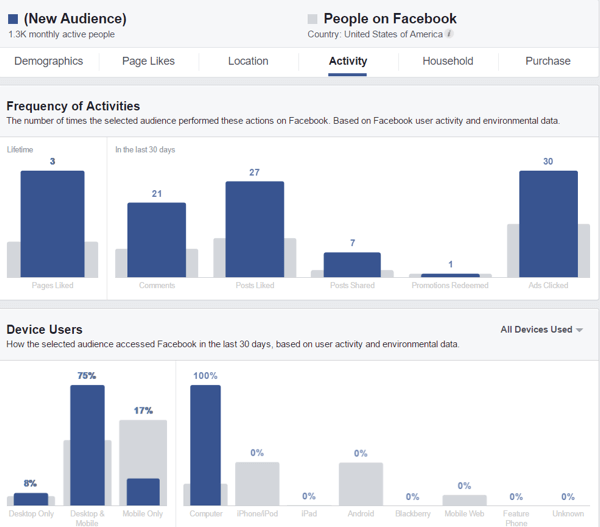 When comparing Facebook ad sets, focus on four different metrics, including time on site. To fix this, try testing different landing page layouts, header text, and images to increase time spent on page. Also, break down mobile/desktop traffic to see if there’s a difference between the behaviors of these visitors. The audience doesn’t like this offer, so offer something else. You’re asking for too much information at this point. Stick to three or four fields max. You’re asking for information they don’t want to share. When you compare these four data points against other ads and ad sets, you’ll have a clear indication of what to tweak, what to fix, what to spend more money on, and what to turn off. Hopefully running these ads for $5 to $10 will reveal your best-performing audiences. You can then scale those audiences, get more out of them, and build more ads to reach them. Never assume that the work is done, however. One thing that I like to do is take a small percentage of the spend and test things that I think could never work, just to see. This is how I learned about how effective lead ads are, how great lookalikes to purchases over $X are, and more. Always test! What do you think? What have you learned from testing that has helped improve your ad performance? Please share your thoughts in the comments below. Azriel Ratz, CEO of Ratz Pack Media, has been managing Facebook ads for over 5 years and has spent over $1 million on online advertising during that period.